Tracey has now hit 44, and still doesn't know what she wants to do when she grows up. She describes herself variably as CEO Domestic Affairs, Research Associate in Child Development, fulltime mother, 'just a mum', internet addict, family scribe, and "bloody hopeless at housework." Another self-label is 'jack of a few trades, master of none'. She is carrying about 10kg of weight that is excess to requirements, despite the bouts of extreme exercise, and hates photos of herself. Tracey has some passionate ideas and beliefs, but hasn't quite managed to do anything of note with them. If she takes the initiative, someone usually swipes her down, so she prefers to sit back and follow someone else's lead. If she agrees with the lead they are taking that is. Usually that is Marc, so it's happy days when he has the time and energy to do so. She doesn't consider herself to be a very 'average' woman because she hates make-up, high heels, soaking in smelly baths, and has never dyed her hair. Current passions: coffee, Cadbury Dairy milk chocolate, and either a beer or wine (or two) to get her through each evening. Avoiding housework. Reading. Her adult swimming squad (usually 2 classes a week), playing tennis again after all these years, and, lately, this business of getting the whole family out on tandems! Loves those happy little exercise endorphins, but isn't addicted enough to make them happen on a daily basis, so pays the price in mood and weight. Gets on the internet every day to play around with web design, read particular boards, diaries, and the newspapers, and loves to yell at the TV and write letters to the editor about politics and hating John Howard. (She's actually had a few published!) At least she is keeping her mind active. Basically, her life revolves around the family. Being there for the kids, and wanting to be with the bloke she married more often. Current Objectives: To eat better and exercise more - bring on those happy little exercise endorphins and lose some weight. Drink less coffee, beer and wine. Find an occupation or personal income source with flexibility. Find occupation for husband that involves less travel away. Work out how to get on top of the housework. Find more family time and husband/wife time to ride bikes, ride new tandem bikes, paddle marathon kayaks, and go bushwalking, canyoning and camping. And to be more successful at being the mother of a teenager with Attitude. Marc is now 42 (yep, he went for the older woman) and he is capable and logical, with a self belief that he is smart enough to teach himself to do most things, whether that be fixing a car, building a house, or making a computer work - hardware, software.. no problem. It's not rocket science. He copes quite admirably with a house full of females.. usually by expecting them all to think like he does! He is conscientious and just a bit of a perfectionist, although that doesn't mean he is any tidier than the rest of the family. He would have made a great teacher, but probably missed his true vocation as a sports commentator, with more than a passing interest, understanding, passion, and ability to intelligently call (from the lounge) just about every sport (bar golf and horseracing). The family also think he should coach one of their netball teams. 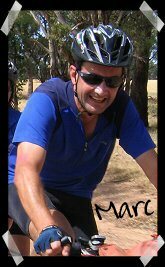 Marc has relied upon a latent store of fitness all his life.. his age and work commitments are only just starting to affect his ability to participate at a creditable level at various sports without any training. That and a tendency for his shoulder to dislocate at inopportune moments. Damn that broken arm from the day he had a go of hang gliding when he was about 20. Current Passions: tandems, and browsing the internet to learn all there is to know about them; the duty to watch any team or person playing for Australia, NSW (and the Swans) and to never give up on said team or person. Enjoys a beer or two most nights. ("He drinks in moderation, but he never ever ever gets rolling drunk...") His once or twice weekly touch footy games are the only thing that can get him out of the office at a sensible hour, and he was pretty happy to get to play in a state and then national Mens over 40s touch side, which meant a few more games of touch to fit in between trips away. Current Objectives: reducing the number and duration of overseas work trips, or even better, finding a miracle job which doesn't involve uprooting the family, but has no away work. 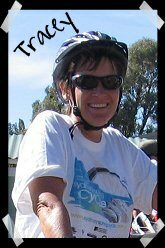 Fine tuning the new tandem, and Tracey's fitness and 'stoker' skills, and managing to do more rides together. Seeing the girls make the most of every opportunity in sport and education. He would also like to see Tracey find her miracle, flexible job. Caitlin just turned into a Teenager, but her mother reckons she has been practising for it attitude-wise for quite a few years. Now in Year 8, she is pretty bright, and has done well academically (getting Dux of her primary school), but freaks her parents out with 'blonde' moments that are occuring, peversely, the more her hair loses its natural blondeness. 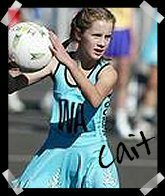 She has been blessed with very decent athletic skills, which she channels into what interests her most at the time. Throughout primary school her focus was to defend her cross country age champion status, and she even made it to State in the junior girls swimming relay team. For a few years there she was obsessed with ballet and jazz. But since high school she has totally ditched the running and swimming and dancing, ("hates" them now, apparently) and has focused entirely on netball, though she has also used her netball skills to hold her own in basketball at school sport. She made the Coffs Rep Netball teams the last 2 years, and has to decide whether to go back for more in 2007. 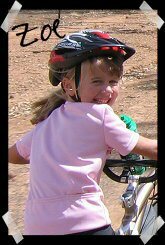 She did her first canyon at the beginning of 2005 and loved it, much to Mum and Dad's relief, and revelled in the achievement of riding the tandem (with Dad) on the Big Ride, even announcing at the end that she'd do it again next year. She also played Touch for the first time last year, and is keen to play again. She has artistic flair which could be channelled into something more, and mucks around pretty competently with image 'stuff' on the computer. Her mother insists that she would make a great Defence Lawyer one day, seeing she puts so much practice into defending the indefensible. Current Passions: staying in bed in the morning as long as possible. Reading. The new Dr Who. The Chaser's WAR on Everything. (In fact watching what SHE wants on TV). Using the computer as much as possible - for MSN, and playing around with images and animation. Finding something to fight about with Alison. Or to complain about Alison. Still loves her netball, although she is a bit rundown after State Age. Current Objectives: getting her mother to stop embarrassing her. To play Touch this year in a team where she will learn more about the game. Is planning on coaching a junior netball team next year, as well as fitting in her own netball. Somewhere in there her parents would like her to look like she is actually doing some schoolwork. Ali is 11, and has always been pretty 'gung ho' with anything active. At 18 months she used to spin the wheels on her dinky. She is an intuitive and strong bike rider, has a beautiful swimming style (getting to the schools regional level on the strength of one swimming squad per week) and has picked up school trophies for running cross country as well. But she eschews the individual sport limelight for the camaraderie of playing in a team - netball is her real passion, and she hopes to make a rep team next year. She sets herself high standards academically (achieving those standards most years), and has been a reluctant school and regional spelling champion! She was also a natural at ballet but didn't much like being looked at on stage. She went through one stage of doing cartwheels everywhere, and another of trying to perfect her headstands, but she has lately channelled that sort of persistence into learning the flute at school. It might be noisier, but it isn't as physically threatening to the people or furniture. 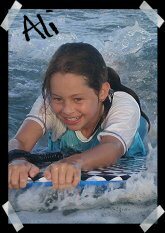 She is the real water baby of the family and loves the beach, as long as Dad is around to take her 'out the back' and put her on the waves. Current Passions: Netball. Netball. And netball. Riding her own bike. MSN and animation workshop. Reading. Loves dogs.. particularly her beloved Rags, even if Rags isn't so demonstrative in return. Current Objectives: To make the first ever Woopi Netball rep team next year; to do well enough with her flute playing so she can play in the school band. Zoe used to be shy, but she has grown into those big blue eyes and cheeky smile. Now she's nearly 8, and while she still isn't big on change, or new things, she is gradually learning that she actually can do all sorts of things she thought she couldn't! Admittedly she has had a couple of hard acts to follow. Doing well with schoolwork and reading has been a snap. The physical stuff has been a bit more daunting, but she has found that, with practice, she can also swim and run, and might even shape up to be a good netballer as well! She's still not keen on riding her own bike.. having been spoilt with having a trailer bike bought for her so we could get out as a family. Guess that's one of the perks you get as the 'baby' of the family. It possibly makes up for all the other garbage she has to put up with! Zoe just loves dancing, and despite being cautious with other things, loves the limelight, and will be in her element in the ballet concert at the end of this year. She also tries harder than anyone to do the right thing, and her mum's only complaint is that she can be a bit vague and forgetful, and a bit too untidy, even by Mum's low standards. She is the biggest cuddle bug there is, and gets quite annoyed when her sisters don't humour her in that department. Just as well she's got her mum. Current Passions: Ballet. Fairies. Reading, especially Rainbow Magic books. Well, actually, reading anything she can. Dancing to music. Running, now that she's discovered she can. And netball is shaping up to be something she looks forward to every Saturday too. Current Objectives: One of Zoe's ideal days would be one that she had Mum and Dad to herself. A day with no sisters? Excellent! Mind you, Mum and Dad think her next challenge is to ride her own bike willingly and with more bravado, so she would probably end up on her own bike (doh!). Zoe would like to collect every book in the Rainbow Magic series, and she's also finally got her own MSN account! Current as of somewhere around 2006! Oh dear!